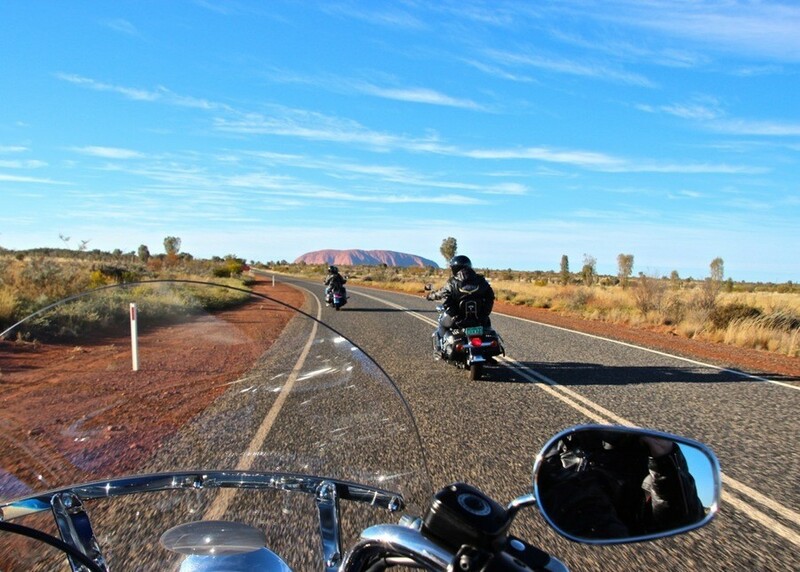 U is for Uluru: 11 Photos; 9 Bloggers; One Awesome Rock! When a Google search produces over 6.5 million results, writing anything else about Uluru becomes SO redundant I’m tempted not to use it for my Aussie ABC. What’s left to say about this massive monolith of sandstone 348 metres (1141 feet) high, 3.6 km (2.2 miles) long, 1.9 km (1.2 miles) wide and 3.33 km² (1.29 miles²) in size? With a 10 km (6 mile) hike around the base if you choose not to take the steep 1.6 km summit track?? And the slowly oxidising surface iron giving it that distinctive red colour, an instant worldwide recognition factor and over 400,000 visitors each year??? But Uluru is WAY more than just statistics. An Uluru experience can be awe-inspiring, surprising, fantastical, adventurous, mind-blowing, healing and deeply moving. Nothing says Australia quite like Uluru. And nothing says Uluru quite like the nine different first impressions of the Rock shared by nine (8 + me!) travel bloggers! Since I discovered Linda’s fabulous Journey Jottings products back in my early blogging days, they’ve accompanied me to a LOT of Aussie Hot Spots! But not Uluru – yet, anyway! By Neil’s Bushwalking Blog standards, a tactful person would describe MY bushwalking skills as ‘average’! Perhaps I can get some hiking credibility like Neil’s on one of the Aussie Hiking Tours on his new website! Jo’s fabulous travel and lifestyle blog Zigazag is a go-to for anyone who wants to discover Western Australia’s hidden secrets AND tales of travel from around the world! But Jo’s WA roots didn’t stop her from visiting Uluru – where you can see what the well-dressed mountaineer was wearing back then!! Jo says: ‘I visited Ayers Rock in 1983 when I was working in Alice Springs. I can remember driving for what seemed like hours along a corrugated red road that made my fillings jangle, and arriving finally at a small hotel, or was it a roadhouse then, I can’t remember where I was told I could pitch my tent. Problem was I’d forgotten the tent pegs so I had to borrow some string to hitch it between two bushes. Full of advice about the Aussie camping scene along with gadgets, recipes and bizarre camping must-haves, Annie’s blog Go Camping is the place to be when you’re planning a road-trip or camping holiday. Annie says: ‘My first impression of Uluru was that of stunned amazement – I had seen so many photos of it over the years, but nothing prepared me for its size and beauty. It really is awe inspiring when you are up close to it, and walking around the base, seeing all these different aspects of it. After getting my regular fix of out-of-the-way Australia from Andy’s blog Travelling Type, he inconsiderately moved overseas to live and work and the Aussie posts thinned out. SO … as revenge, I’m hoping this post makes him homesick as hell! I’ve never travelled Australia with kids and probably never will. But I certainly agree with the concept behind Mandy’s great blog Travelling Australia With Kids – especially if it makes those kids grow up to appreciate the awesome natural attractions in OZ. Like Uluru! Mandy says: ‘Something somewhere inside stirred and I felt like it was connecting with my soul! All sounds a bit spiritual, but seriously I was moved on a level I had not experienced before. I just wanted to look at it and experience it and absorb it. Hence 163 photos! We’re both Aussie travellers, bloggers and red-heads, so that makes Amanda and I virtually twins, right? Apart from a few trifling details like her radio show, overseas travel and a few years in age! Amanda’s first time at Uluru was a very different experience as she writes on her blog Adventures All Around! Amanda says: ‘I’d seen all the pictures and heard all the stories, but still nothing prepared me for what it feels like to be in the shadow of Uluru. To look up at that huge rock and see the caves and crevices and the colours. Michela’s travels in Australia, documented on her blog Rocky Travel, put many Aussies to shame. Her Top Tips for planning a road trip to Uluru are great advice – and she’s the only blogger to date that I’ve met face to face! On the 100 km trek along the road to Uluru from Curtin Springs, where we’d staged a two-person protest against the high cost of accommodation closer to the Rock, I was distracted by wildflowers lining the road – the result of a wetter than average year. But then I looked up out the car window and there it was dominating the landscape and pulling us towards it like a magnet – maybe there’s something in the ley lines theory after all! I just HAD to get closer – but when I saw the WAY steep and exposed track to the top, I just knew I wouldn’t be climbing it. So big it made the huge rocky domes of nearby Kata Tjuta look like marbles, Uluru’s ever-changing colours are endlessly fascinating. And the rocky pools, waterfall spots and wave-like formations made the base walk a wonderful experience. Wanting a part of the rock made me almost see the point of those kitschy Uluru snow dome souvenirs too. So I bought one – and it looked a bit like THIS! 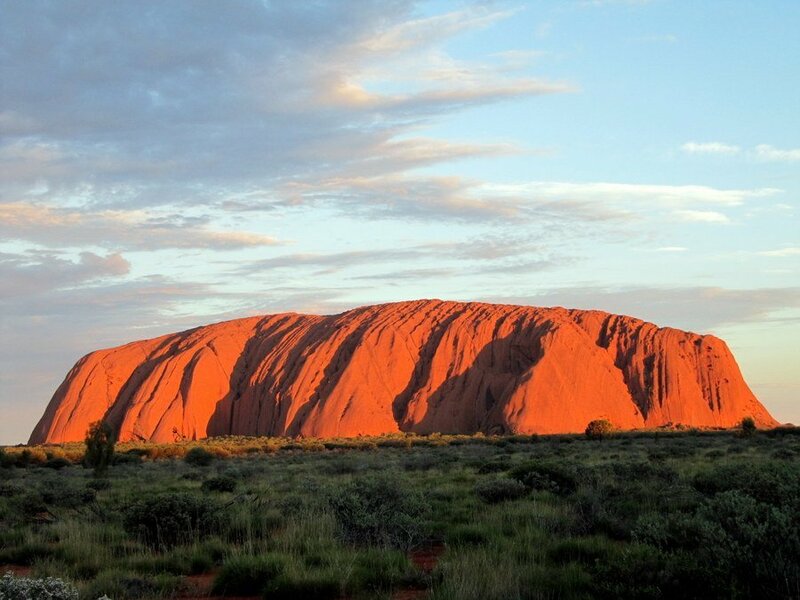 With those 6.5 million results from the ‘Uluru’ Google search, I have no fear that this’ll become the definitive ‘go to’ post for travellers seeking information and inspiration about Australia’s iconic rock. 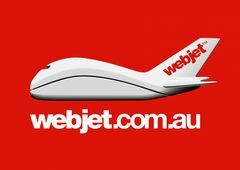 But travellers unedited first impressions never lie – so if you’ve been thinking about visiting or re-visiting Australia’s BIGGEST Rock Star, then DO IT NOW! Have YOU been to Uluru? What was YOUR first impression of Australia’s TOP Rock Star?! Previous Post: Australia’s 10 BEST Camping HOT Spots! « Australia’s 10 BEST Camping HOT Spots! Wow. Such a breath taking rock. Having people talk about Uluru makes me want to visit. It seems so popular but I’ve never visited, I’d love to have my own view of the Uluru, sure I’d have a different perspective. I’ve only been once, Lydia – but it’s an unforgettable experience! Hope you get to see it one day! This is a really great list of Aussie blogs! I am hoping to visit Uluru with my Maldivian partner later this year. I will be bookmarking this comprehensive post for sure! Thank you! The Uluru rock looks magnificent. I liked reading about the different perspectives of the rock as well as looking at the various pictures. All of them invariably point to the intriguingly mesmerising beauty and power of the rock. It IS an amazing place, Sandy N Vyjay – I haven’t heard anyone say otherwise, but it was still a surprise to read the different responses that each blogger had to the ROCK! Uluru is certainly an Awesome rock. We did the base walk – 10 kms – which felt further – but well worth it. We bombed out on the sunrises, but had a spectacular sunset – eventually!. Hoping to go back to Uluru and NT one day soon! I failed the sunrise test too, Jill! But in my defence, we WERE staying at Curtin Springs, about 100 km away!!! That’s a fine excuse, right?!?!?! I’d love to see it again – I often wonder whether that sense of awe and amazement will be there as strongly on a re-visit! I really enjoyed seeing everyone’s photos and reading their impressions of Uluru. When we planned our own trip there, I was afraid I’d take one look and say ,”Yup, it’s just like the photos.” I was so glad to discover that visiting in person, getting to walk around it and up close, and seeing it from all angles was a zillion times better than looking at a photo. It really IS one of the few major tourist attractions that actually lives up to it’s own PR, Michele! And even though my photos look suspiciously like many others, the real thing is mind-blowing. I’ve only been once – it’ll be interesting to go again and see what my second impression is!! Amazing photos. I have only seen Uluru from the air but hopefully I will get there one day soon! Uluru really is an awe-inspiring place, isn’t it! It’s one of the few places in the world that my teenage son, who hates traveling, wants to go visit again. None of my pictures even came close to capturing it, but some of yours come a lot closer! Uluru provides so many different experiences and memories to so many different people. I had the privilege to cycle around the Rock last week as a member of a 60-strong group raising funds for the Black Dog Institute. There is something certainly spiritual about this sacred piece of land. One can feel the radiation when standing alongside it. It’s an experience every Australian should savour. I agree, Michael – while there are a lot of great places in Australia, Uluru is really something special. Your ride sounds like an amazing experience and I’m sure it’ll bring you good karma (although I know that’s probably not why you did it)! 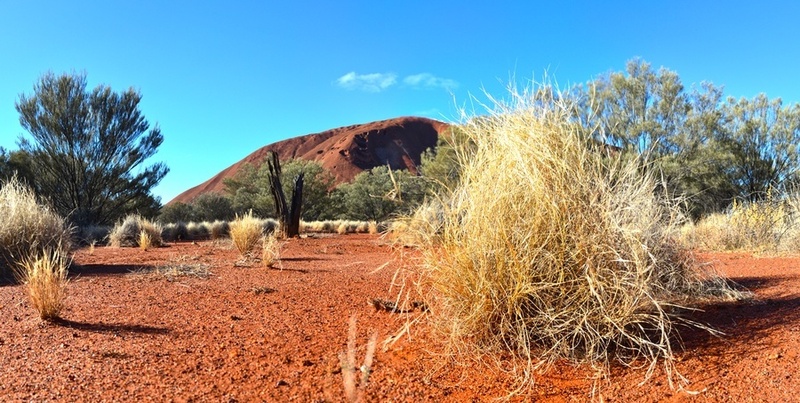 Thank you so much for sharing your experience – everyone has had a slightly different version of their visit to Uluru, and yet there are similarities with all of them! Have a great day!! What some different perspectives! I love them all, and what a great idea to do a collaborative post. Thank you for including me too. You rock Red! Haha, I WAS going to call the post Red Rocks RED ROCK, jo, but that would have been egotistical 😀 Seriously, it was fascinating to read the different ways the rock affected different bloggers, and it was REALLY fascinating to see your ‘antique’ photo! Film cameras rock, right?! Great post and I must check out some of those bloggers. I visited Uluru before I started blogging so my record is photos in an album. I was amazed how it just loomed out of the flat ground. I loved the way it changed colour in the early morning and throughout the day. I’ve never been there and always just known it as that big red rock in the middle of the country, where all the red dust is. I’ve learned over time that it has waves, textures, colours and even waterholes; Linda’s photo of one is just beautiful. I’d love to be there with my camera for sunrise and sunset one day. You and hundreds of others, River! I didn’t make sunrise (seeing as we were staying 100 km away), but sunset was as crowded as a Friday night happy hour – with almost as much booze!!! Not that it mattered – once the sunset colours hit the rock it was quiet, except for the constant clicking of cameras!! Hope you get to see it one day, and yes – Linda’s photo is one of the gems of Uluru! Hi Red, an inspiring collaboration from some great bloggers. Actually you did make me a little homesick! In my opinion, this is one of the more unique and special parts of Australia and I enjoyed reading these different experiences. Haha, then my work is done, Andy! Seriously, visiting Uluru is an experience so compelling it’s hard to believe I’ve only been there once – it’ll be interesting to see what’s changed next time I visit, but I’m pretty sure the essentials will still be the same. I didn’t really mean to make you homesick – your experiences abroad are fascinating! Very lovely series of shots of the ‘rock’. 2 visits we have had there. After travelling along flat country for a fair distance then all of a sudden seeing the ‘rock’ is rather brilliant. One would think that it would be seen long before we do. Fabulous collection of photos! We are visiting Uluru for the first time next year! Can’t Wait! I do hope I can capture it as well as this group of bloggers have. You’ll be able to capture it better than I did, Judi! On my one and only visit (so far!) I was using an old point and click film camera – and was nowhere near as experienced at the finer points of photography like a straight horizon, and eliminating stray trees!! Even so, my inexpert pics still bring back memories! I love that you have taken 9 different blogger’s points of view about Ulura. Very clever! I haven’t been to Uluru yet, but I hope to get there one day. Great post. Even though the 9 points of view are different, there’s a common thread – EVERYONE agrees how amazing it is! Hope you get there soon, Kathy – it really is an Aussie ‘must do’!! We´ve been there 11 years later than Jo and, my, was the place packed! Sunrise and sunset were awesome, despite the mass of people. We wandered around and enjoyed all the details. Woderful pictures, teh colors are so intense. I think it’s always packed now, Iris!! But even though I’m not one for crowds, it didn’t matter because the rock was so FAAAABULOUS!! Thank you so much for the honey – I have emailed you!! Thanks for including me in the round-up of Uluru fans! Plus I get to read some new blogs too that I didn’t know about. I think every Australian should visit Uluru, Jo-Anne! I hope you get to see it one day SOON! I once thought of visiting Uluru, but I gave it up because it was too far from me and it’s in a vast desert without anything else – At least I felt so. But real travelers’ voices are convincing. It must be extremely scenic. And, I can’t help asking this, Red! where is a scenic public toilet??? It IS a long way from anywhere, Kozue – but it’s worth visiting next time. Once you’ve seen it, look at the link at the bottom of the post for 7 other things to do once you’ve seen it – that way your trip will include plenty of other scenic attractions! And the scenic loo? One of my first ones was from Kata Tjuta nearby! In fact that was the very first one I ever photographed! It is one of those wonders of the world you have to see especially at the end and the beginning of the day. I feel that visitors should respect its heritage and significance and not climb it. Uluru moves people in so many different ways, Fun60! I didn’t climb the Rock for various reasons including heritage, but also including plain old FEAR of heights! There are many arguments about climbing/not climbing and I would generally agree with you. BUT … while I was researching this post, I came across a comment on another site about a person who (like Neil, above) was in a very bad place. So she climbed the rock as part of her spiritual journey where she found healing in being able to meditate and absorb the energy of the Rock. Now I’m not so sure that climbers should be stopped – but it’d be hard to apply a ‘correct motivation’ test wouldn’t it?!? !